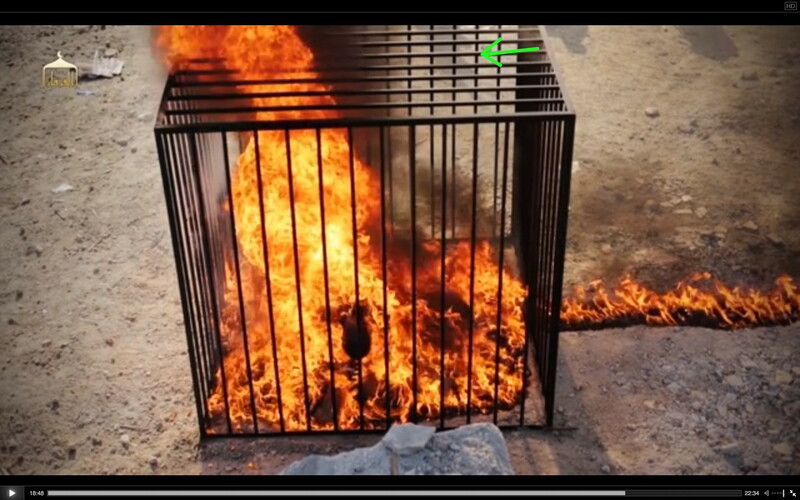 I’ve written several posts about the murder of Royal Jordanian Air Force pilot Lieutenant Moath Youssef al-Kasasbeh by the Islamic State. Many readers have found some of my points too subjective, or else they got sidetracked by minutiae. 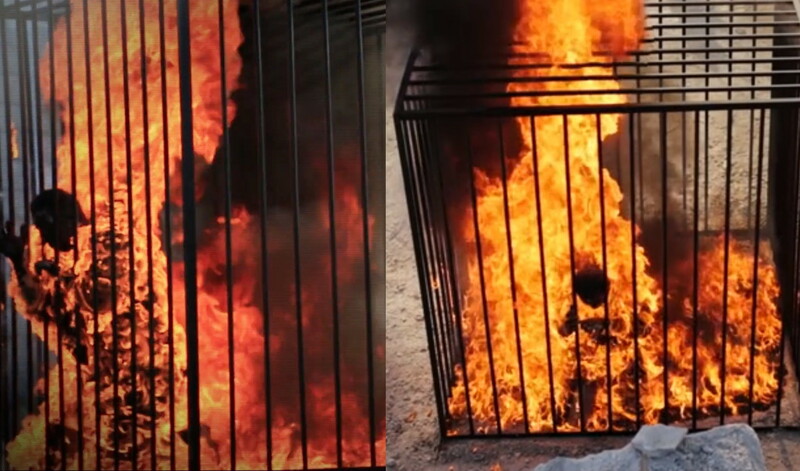 I’ve therefore decided to collect on this page all the inarguable evidence that Lieutenant al-Kasasbeh was not burned to death. 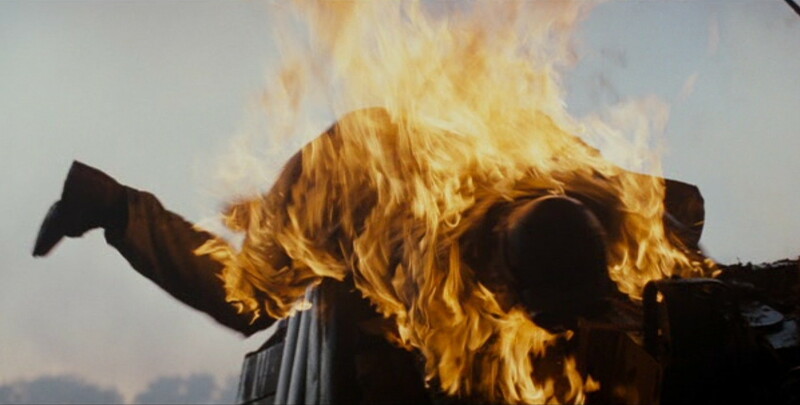 He was murdered, but the flames were computer-generated imagery (CGI), and several takes of the “death scene” were shot. 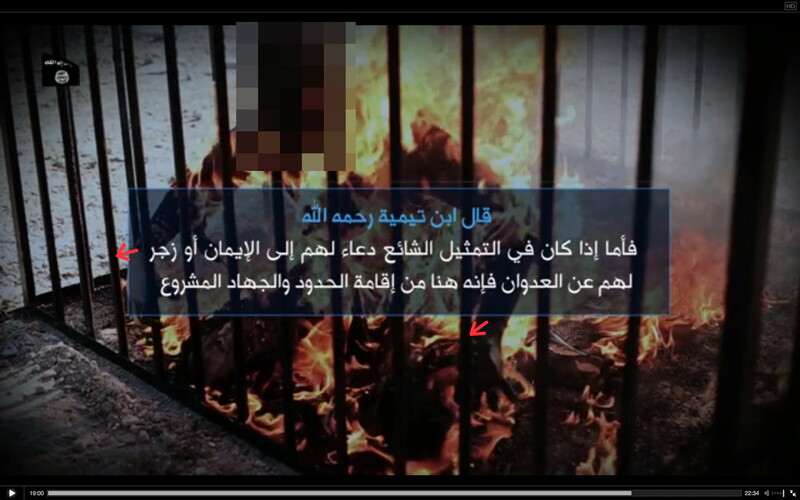 The Islamic State footage that shows Lieutenant al-Kasasbeh being burned alive is fake. 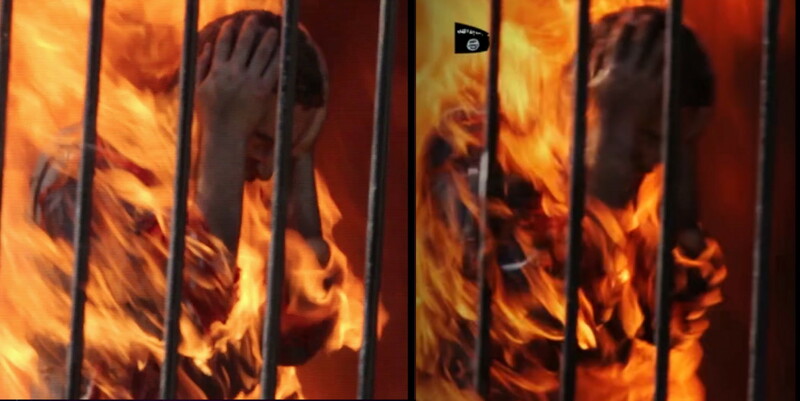 Lieutenant al-Kasasbeh cooperated in miming his death by fire because the terrorists promised that they wouldn’t hurt him. An Islamic State defector confirms that executions are rehearsed, and hostages are told that they are guests who won’t actually be killed. The lieutenant was a brave man who volunteered to fight the most savagely inhuman enemy of modern times. If the Islamic State promised to not kill him, he was wise to do as they asked. But he was shot in the head while on his knees, no doubt in a surprise move. Then they doused his body in gasoline and burned him. 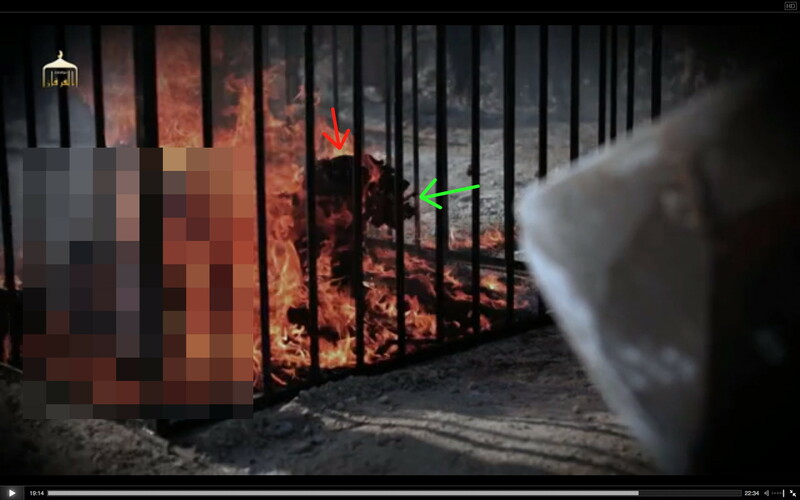 The Islamic State first released Healing the Believers’ Chests, followed by A Message to Jordan, which contains additional video of the “burning.” Watching the two high-resolution films together proves that both are fraudulent. 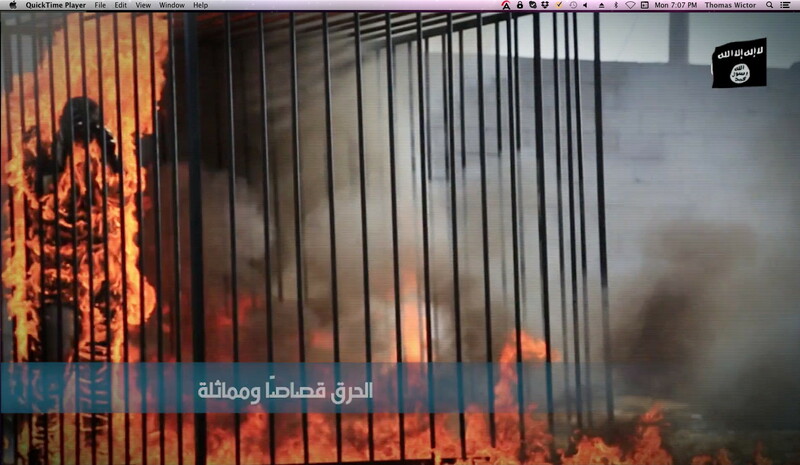 If we’re to believe the Islamic State, nine cameras filmed the burning. 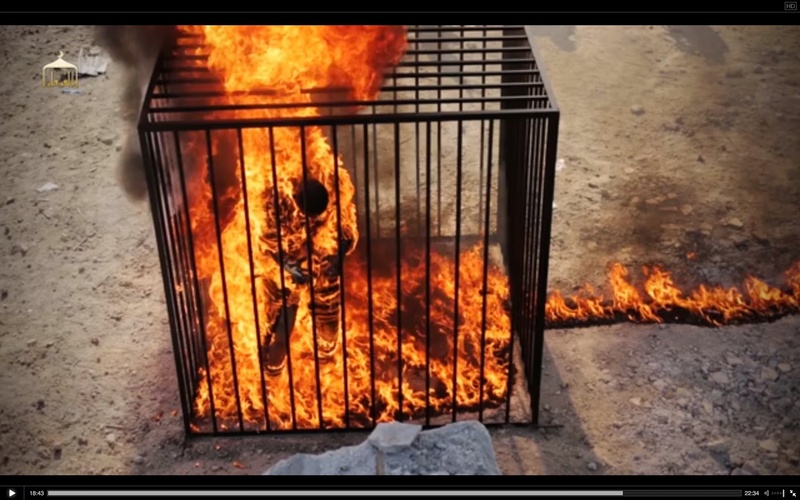 Click images to enlarge, and remember: YOU ARE NOT SEEING A MAN BEING BURNED TO DEATH. 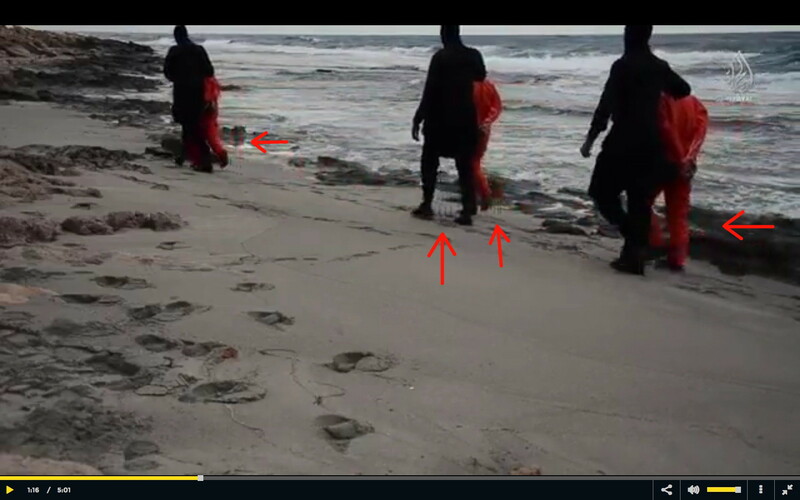 Initially it appears that Cameras Three and Six are the same, but the unedited footage of A Message to Jordan shows us that the operator had less than four seconds to go from ground to head level. Camera Six is stationary and shooting perfectly composed video. It would’ve been impossible to reposition the camera in less than four seconds. The camera was raised during one of the many takes they shot. Camera Five shows us that Camera Three and Camera Six don’t even exist. They should be visible on the right. The reality is that no more than three cameras were used. They were placed in the nine different positions as several takes were shot. We have proof that at least two takes were filmed. On the left is A Message to Jordan; on the right is Healing the Believers’ Chests. The time of each video is noted. 2:33 and 18:44. The synchronized sequences begin with Lieutenant al-Kasasbeh reaching for the cage bars. 2:34 and 18:44. On the left, he’s still standing, holding two cage bars, while on the right he’s falling to his knees, both hands on one bar. 2:35 and 18:45. On the left he’s just collapsed to his knees. On the right he’s already sitting back on his haunches. 2:36 and 18:47. Both images are very similar, but then there’s a major change. 2:37 and 18:49. On the left he grips two bars—one with each hand—while on the right, both hands are on one bar. 2:38 and 18:50. He finishes each take in the same posture. However, in A Message to Jordan it took him three seconds to collapse to his knees (2:33 – 2:36), while in Healing the Believers’ Chests he fell in one second (18:44 – 18:45), despite the film being slowed for dramatic effect. There’s also a continuity error that proves that at least two takes were filmed. In A Message to Jordan, he “dies” gripping the sixth bar from the right, while in Healing the Believers’ Chests, he’s gripping the seventh. His hands are marked with blue arrows. This error alone proves without question that both films are hoaxes. A second continuity error provides more undisputed evidence of phoniness. 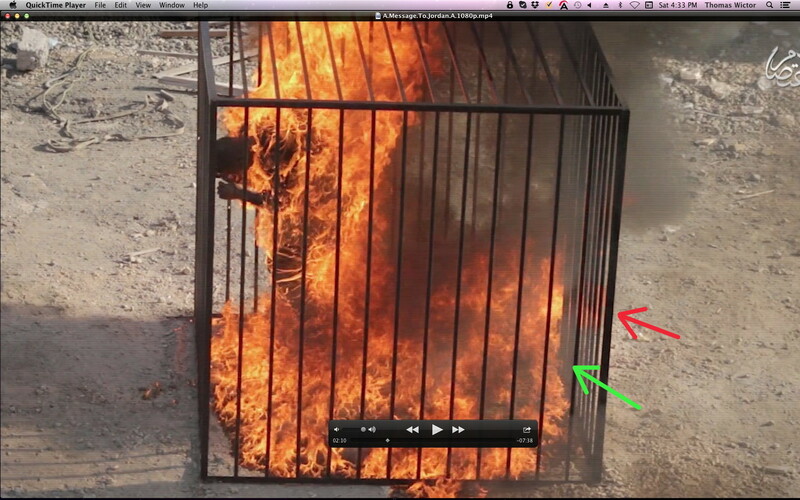 In Healing the Believers’ Chest, a short metal rod is seen on the ground at the corner of the cage (red arrow). This rod is absent in A Message to Jordan. 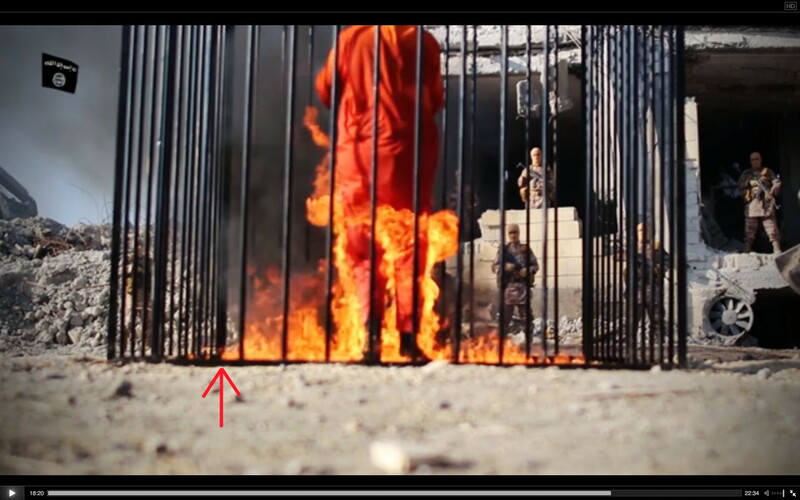 Finally we come to the many problems that the Islamic State had animating the flames using CGI. 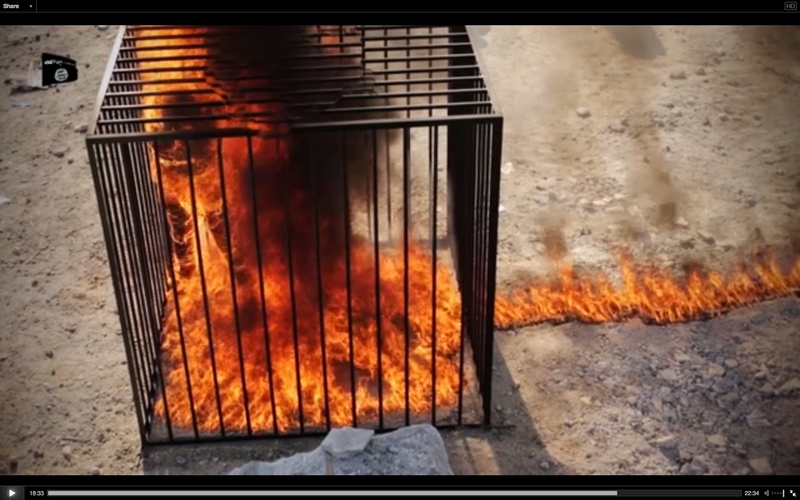 The most obvious issue is that the bars on the top of the cage in Healing the Believers’ Chests appear to rise like escalator steps in sync with the flames and smoke. 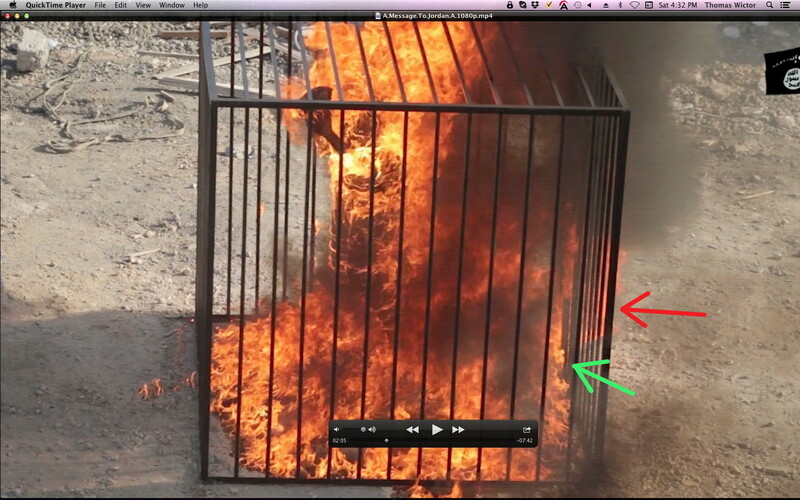 Below are two screen grabs that show the same moment, shot with the same camera: A Message to Jordan is on the left, and Healing the Believers’ Chests is on the right. The flames are entirely different, which means they were added in post production. 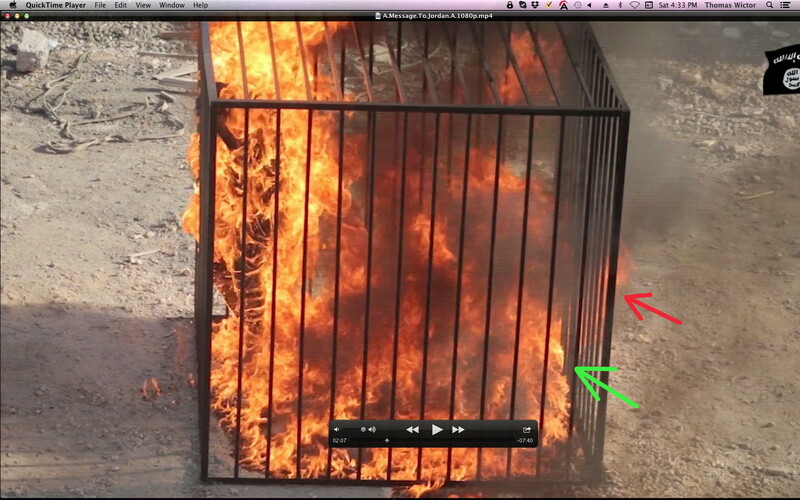 Camera Five in Healing the Believers’ Chests shows that the video effects (VFX) artist was unable to make the flames and smoke go beyond the cage bar marked with the red arrow. 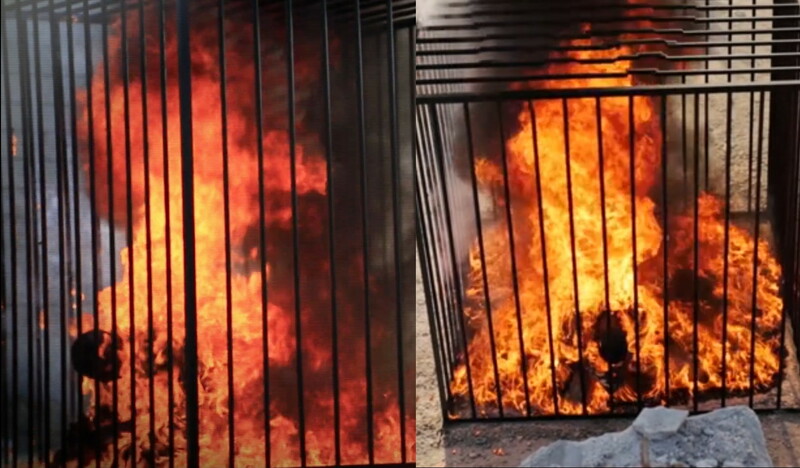 Note that you can see clear blue sky between the bars to the left of the flames. 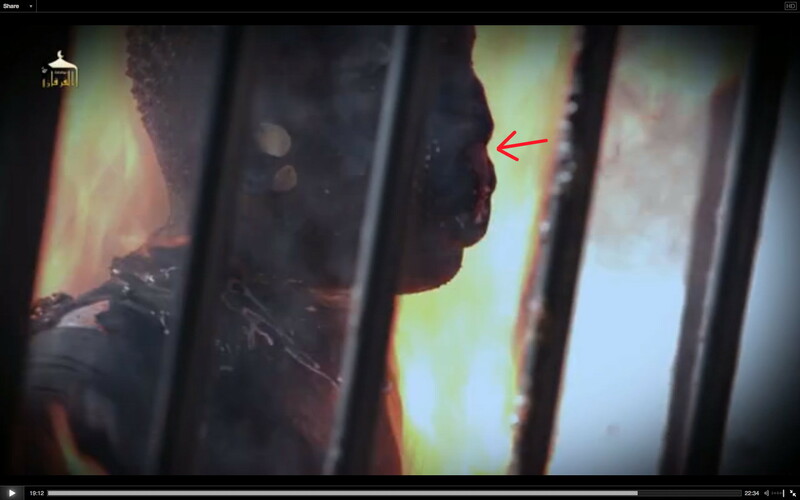 The smoke then reappears outside the cage. They had a similar problem with smoke and flames in A Message to Jordan. 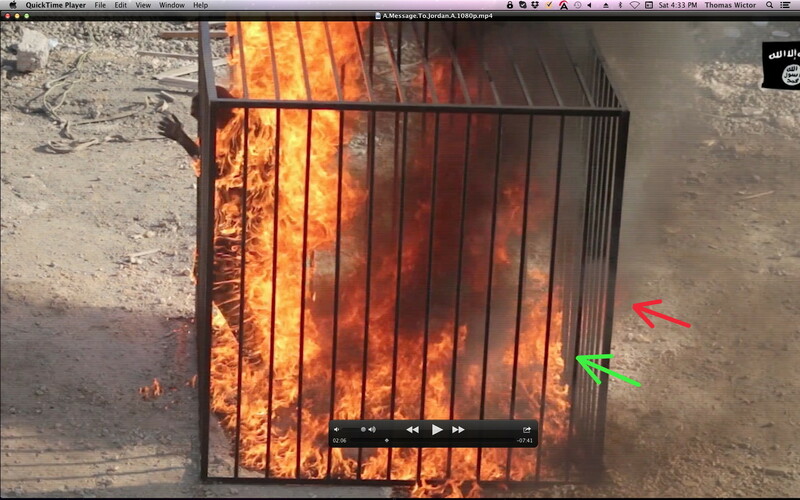 At 2:05, the fire suddenly begins avoiding two cage bars (green arrow), and the flames inside the cage appear behind the structure (red arrow). 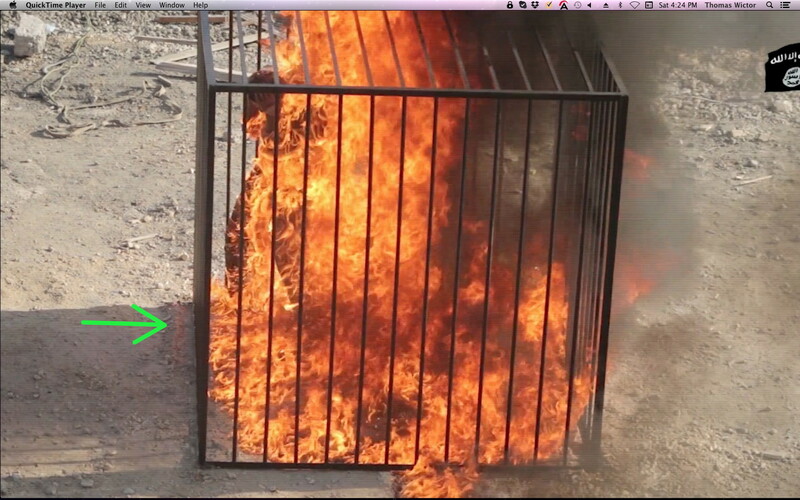 Also, the smoke stops obscuring the bars of the top right front of the cage. The view of those bars becomes crystal clear. Filmmakers and terrorism experts agree that the Islamic State film A Message Signed with Blood to the Nation of the Cross—the Islamic State murder of Egyptian Coptic Christians—is fake. 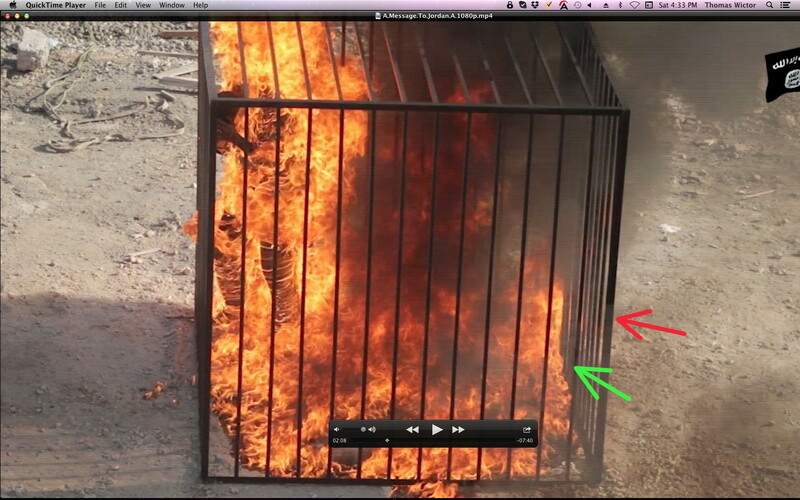 Much of it was shot in front of green screens, resulting in anomalies such as the giant terrorists, afterimages, and color flares seen in the screen grab below (red arrows). 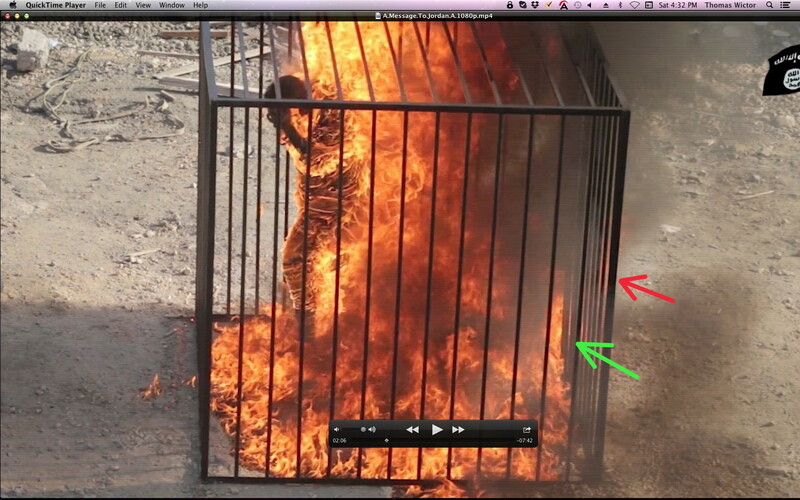 A color flare (green arrow) appears in A Message to Jordan, indicating that some of the video was shot in front of a green screen. Healing the Believers’ Chests also shows the shadow of the director (green arrow). He holds a small, rectangular object in his left hand and makes large, circular motions with his right. 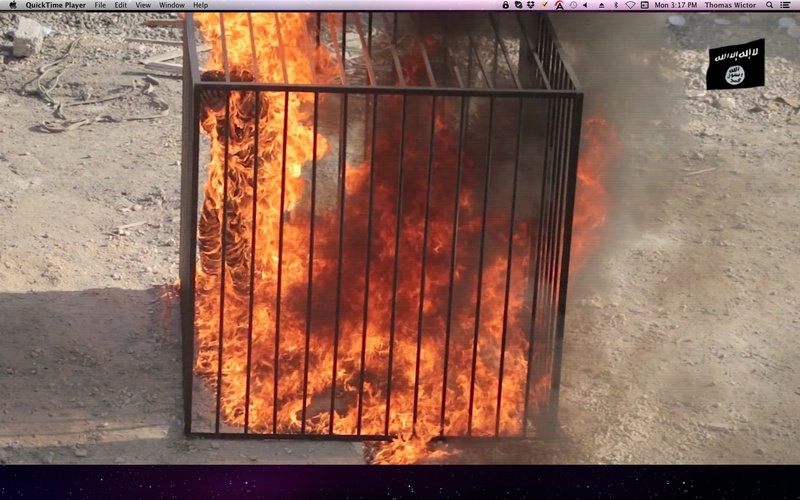 Here’s how a major Hollywood studio renders flames in CGI. 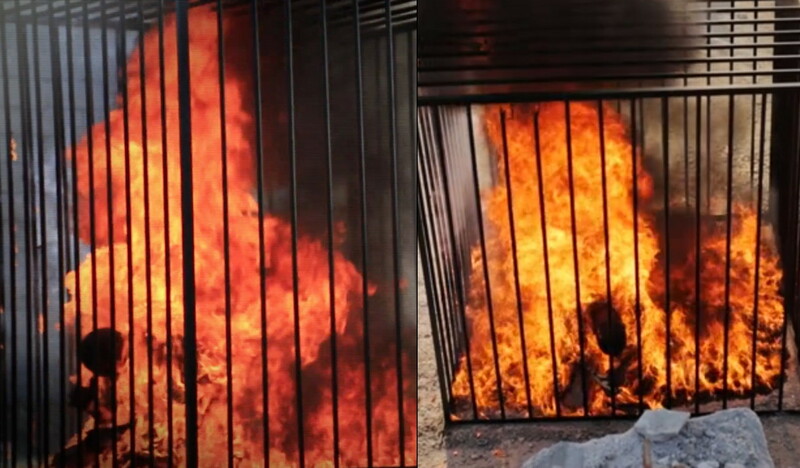 Compare the image above to Islamic State CGI. 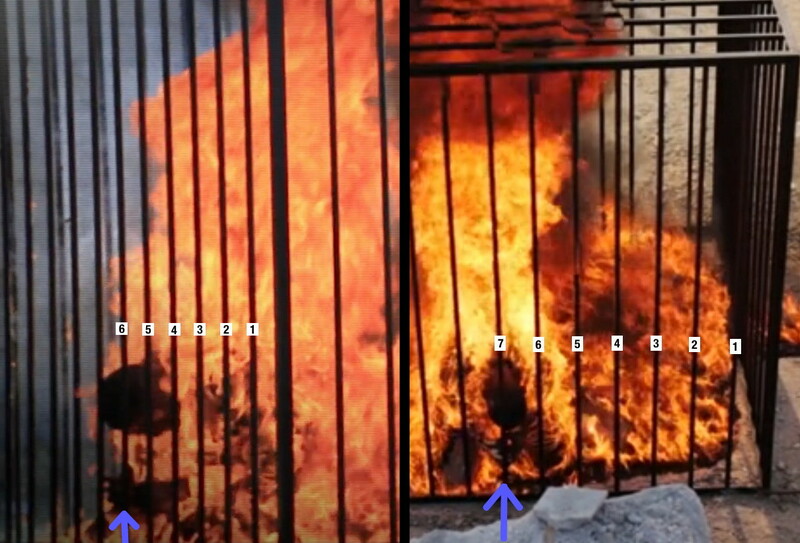 In high resolution, you can see that the Islamic State flames are shoddy daubs of color—dots, squiggles and what looks like neon tubing on the legs. After the many takes were filmed, Lieutenant al-Kasabeh was shot in the right side of the forehead with a pistol. 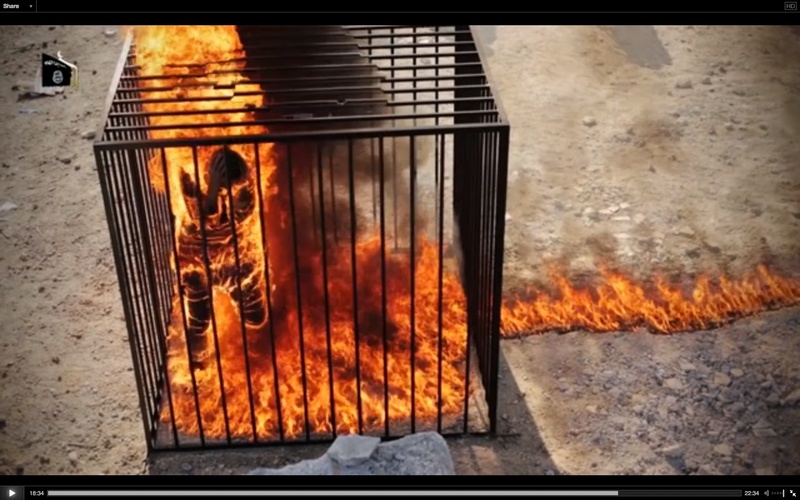 He was killed while he was in a kneeling position, in order to try and maintain continuity with the “burning” footage. 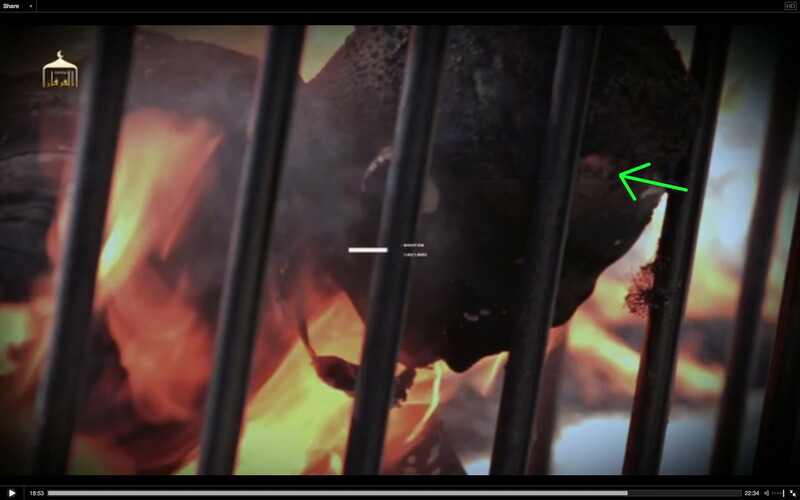 The bullet wound (green arrow) is clearly seen in Healing the Believers’ Chests. WARNING: PHOTOS OF AN ACTUAL DEAD, BURNED BODY. As he falls back, a thick, pink stream is seen flowing from his nose (red arrow). He was shot by a man standing in front of him; the bullet entered his skull at a steep, downward angle, piercing his sinuses. The fatal gunshot is the source of the blood and other material flowing from his nose. 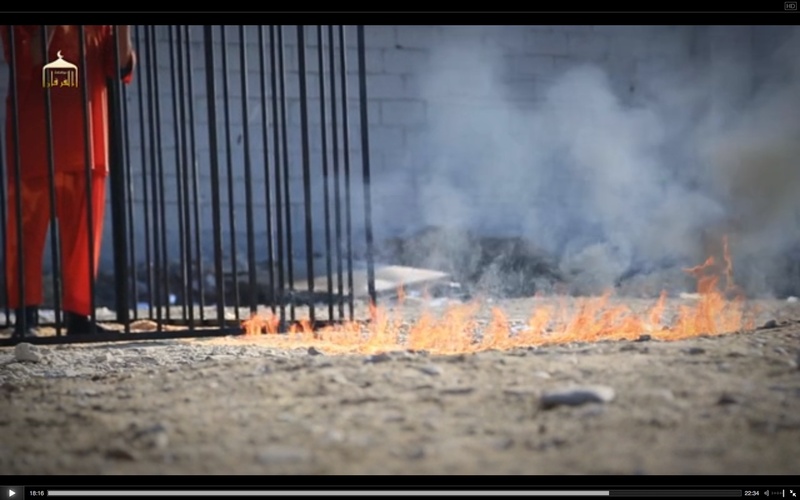 Lieutenant al-Kasasbeh was killed before his body was burned. Corpses that are burned assume the “pugilistic posture,” meaning the arms are held in front of the body, bent at the elbows. 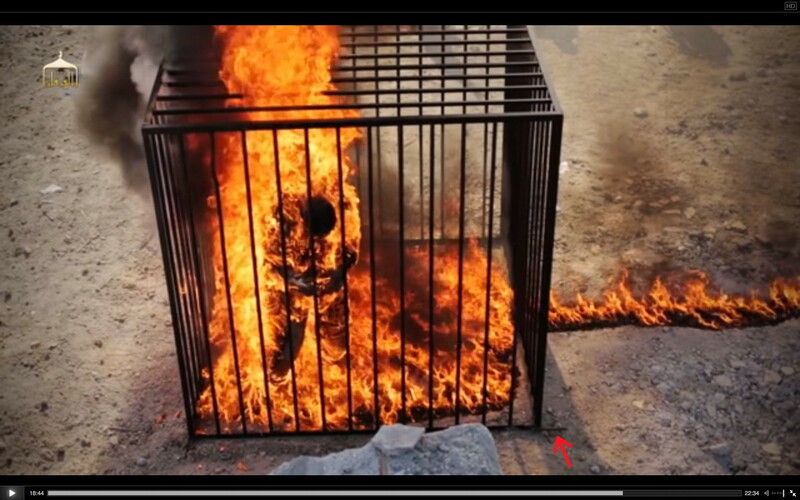 As can be seen in Healing the Believers’ Chests, Lieutenant al-Kasasbeh’s arms are spread. 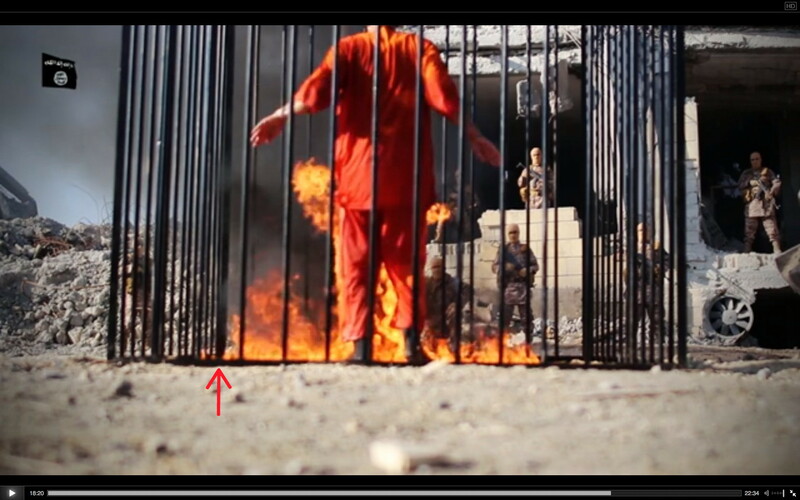 They were tied to the cage bars (red arrows) to keep him in the position required. That explains why his wrists are bent: The backs of his hands were pressed against the cage bars. 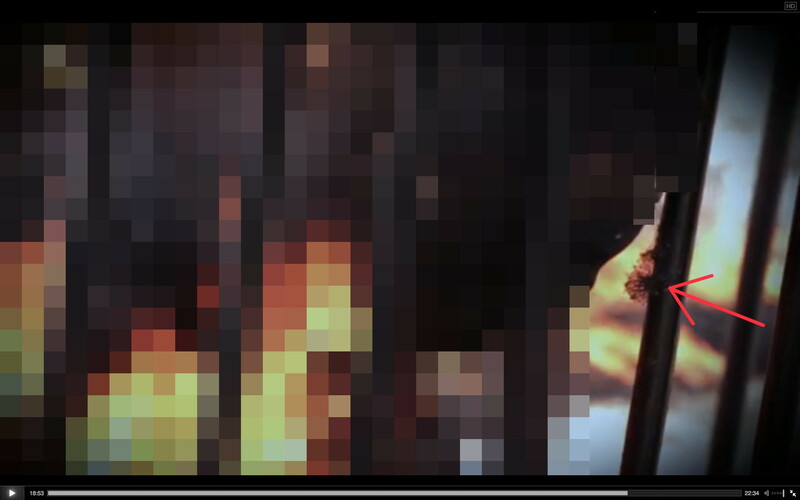 It’s not possible that the burning caused both hands to randomly end up in perfect alignment with two bars. They were tied. 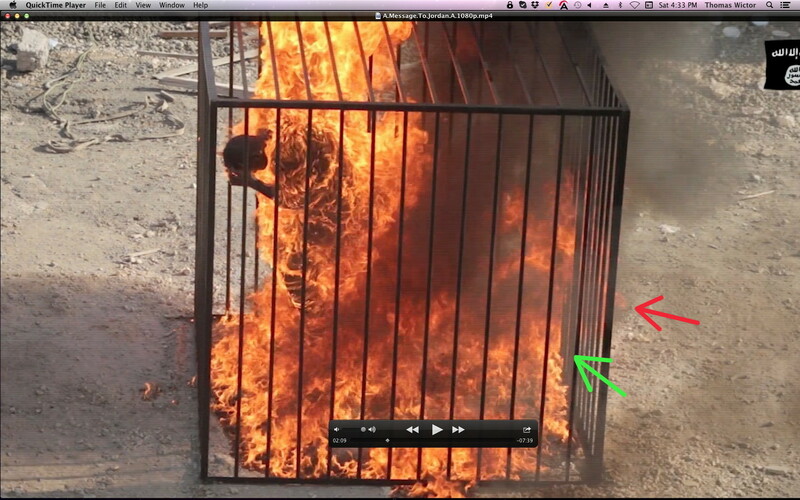 They may have also tied his head to the car bars; rope fiber (red arrow) is stuck to the metal. 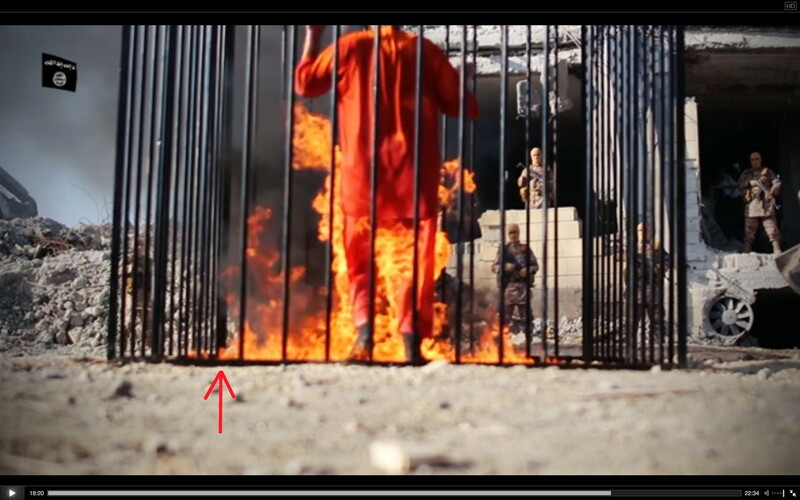 Once he topples over, you can see that the cloth on the front of his leg has survived (green arrow). 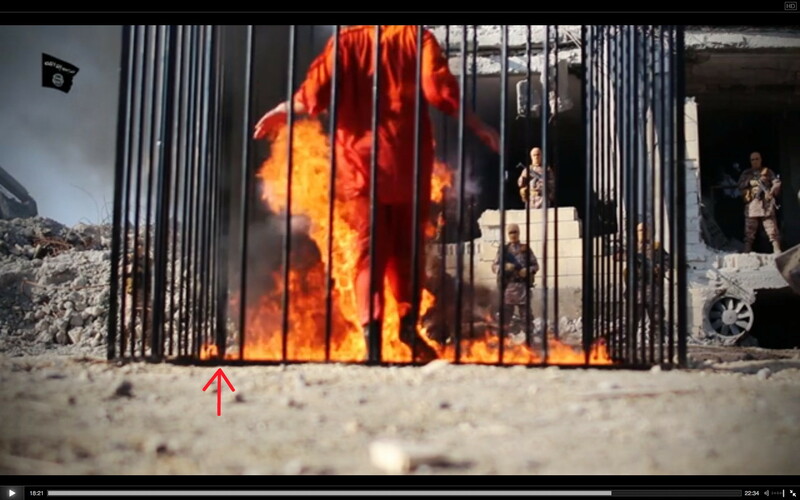 The red arrow shows his left knee. 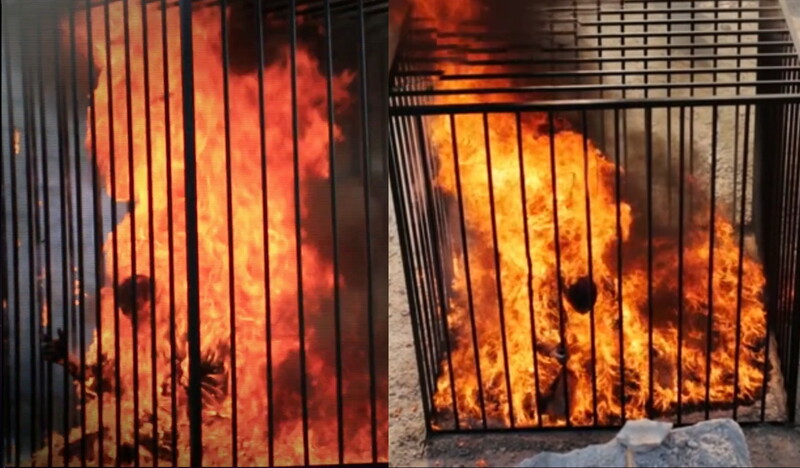 The cloth was not completely consumed because it was protected by Lieutenant al-Kasasbeh’s leg. 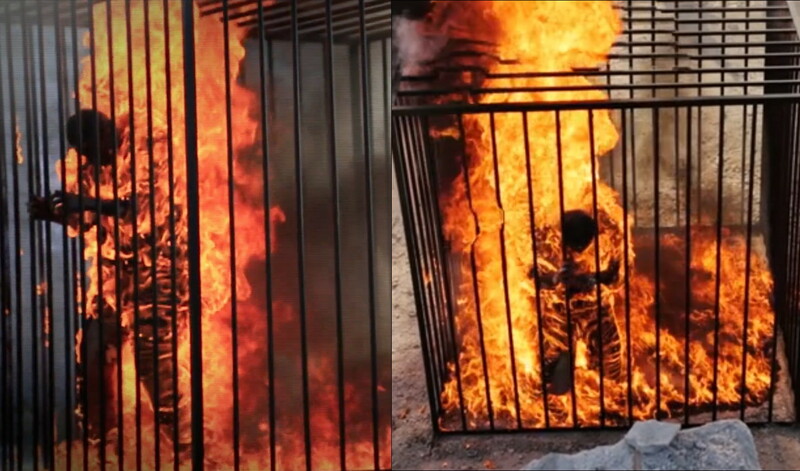 This is proof that he was burned while in a kneeling position. 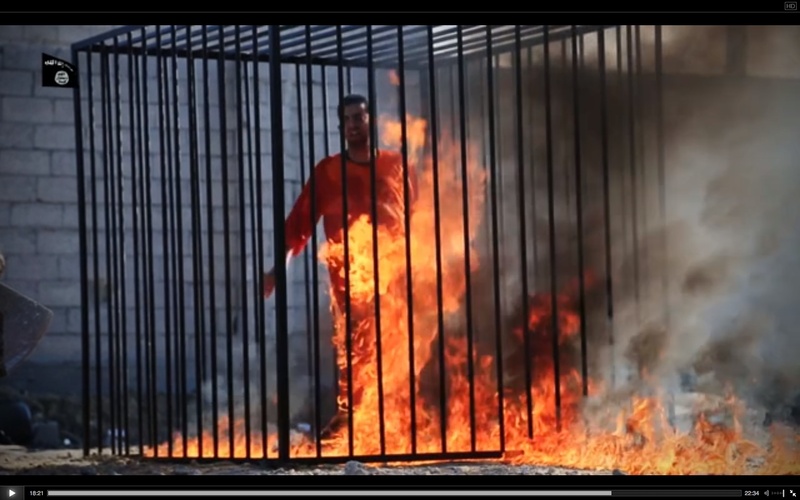 If he’d been soaked in gasoline and set on fire while standing, his trouser legs would’ve burned completely off. 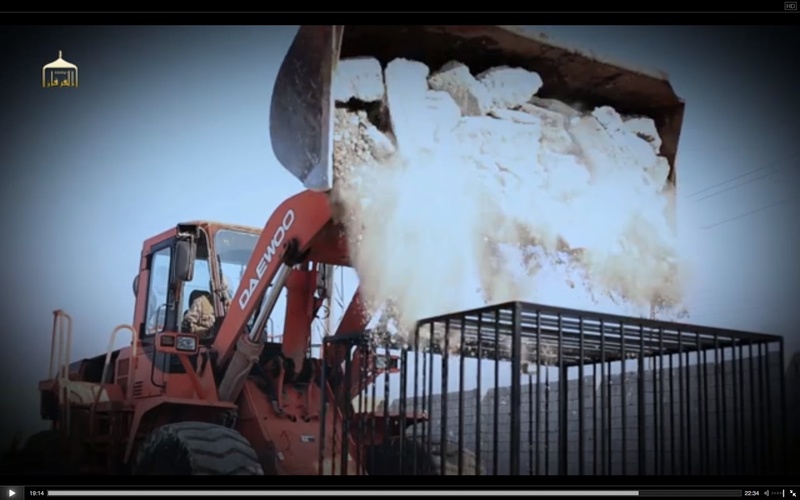 When the front-end loader drops the rubble on the cage, there’s no smoke coming from Lieutenant al-Kasasbeh’s allegedly still-burning body. 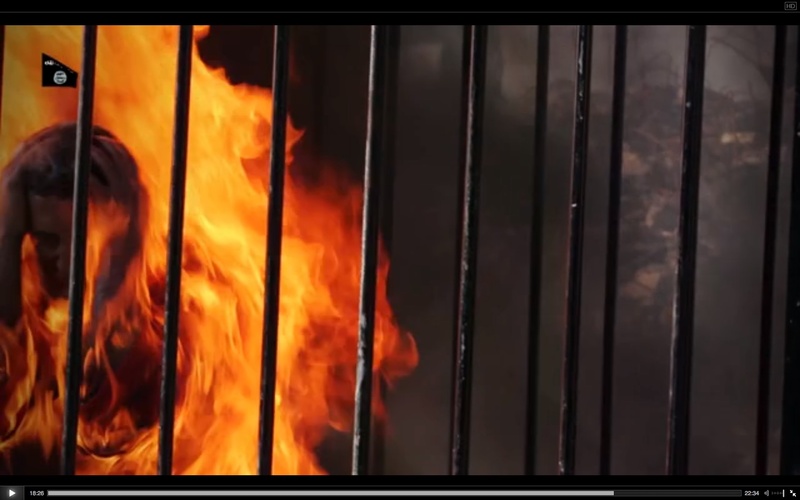 Absolute proof that multiple takes with more than one cage were shot. 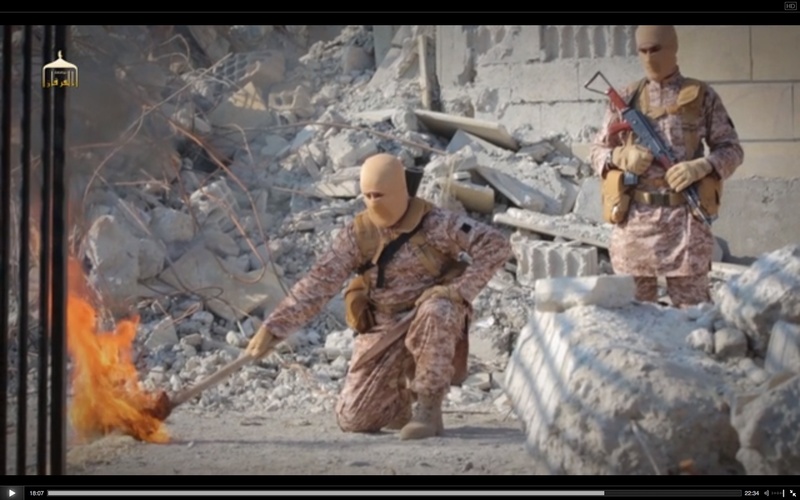 Why would the Islamic State fake this movie? The short answer is control. Healing the Believers’ Chests is a recruiting video. 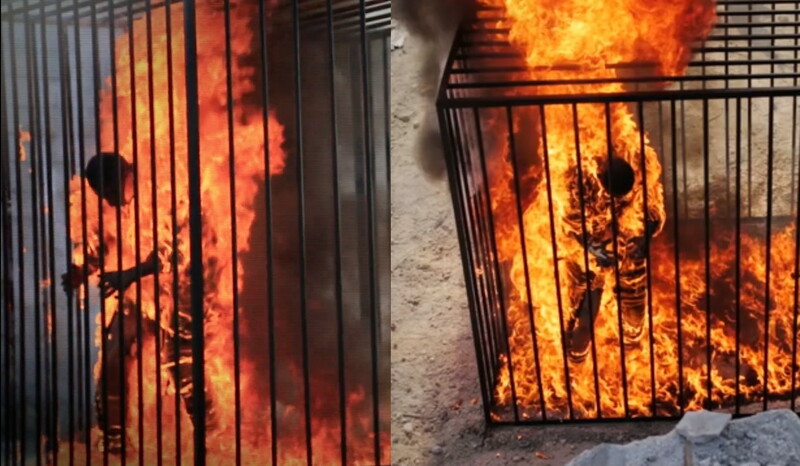 This was the first time that terrorists had captured a fighter pilot alive, and he was a Sunni Muslim to boot. 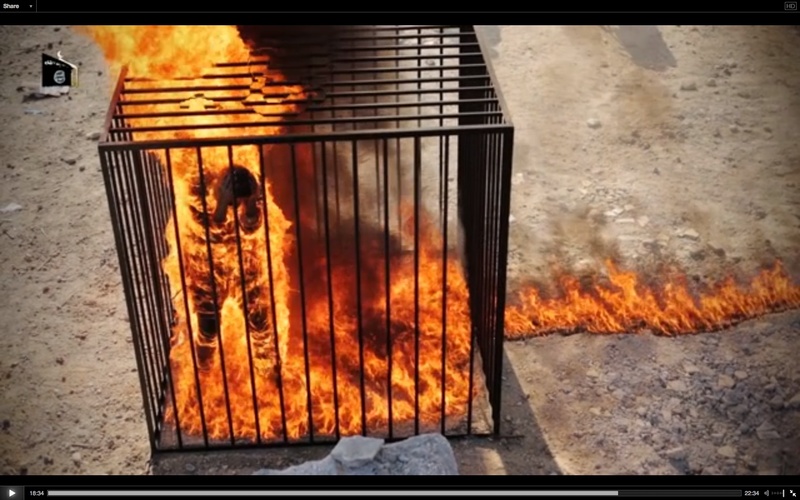 The movie shows Lieutenant al-Kasasbeh “confessing” to his “crimes” and then meekly accepting his “just punishment.” The Islamic State couldn’t risk the lieutenant fighting back. Also, a man set on fire can’t be directed. Lieutenant al-Kasasbeh sank to his knees and surrendered to his fate, as the terrorists wanted. 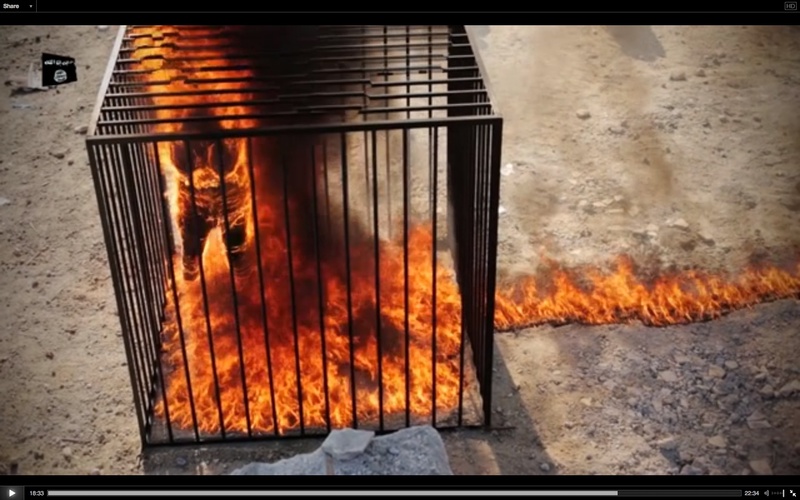 If he’d actually been soaked in gasoline and set alight, he would almost certainly have knocked over the flimsy cage in his death throes. I debunked Healing the Believers’ Chests and A Message to Jordan for two reasons. Firstly, I wanted to expose the Islamic State as charlatans, in the hopes of disrupting—however insignificantly—their recruiting efforts. Secondly, it’s important for the family and friends of Lieutenant Moath Youssef al-Kasasbeh to know that he didn’t die the way the terrorists claim. 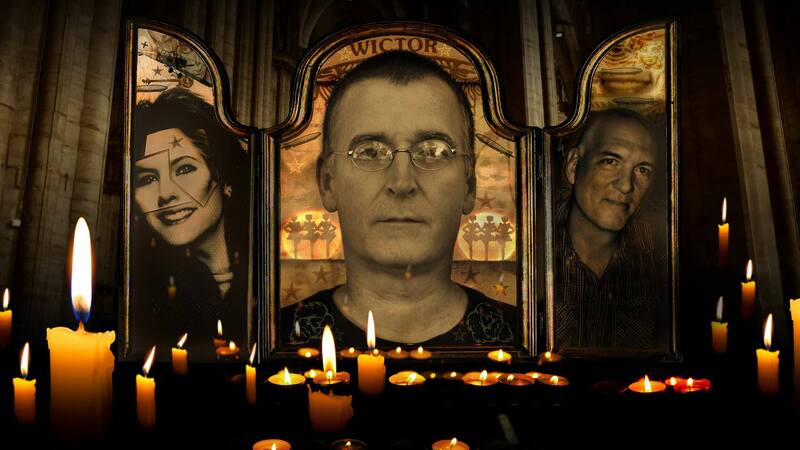 Since they murdered him, they deserve everything that’s coming to them. But he wasn’t burned to death. He was spared that horror. 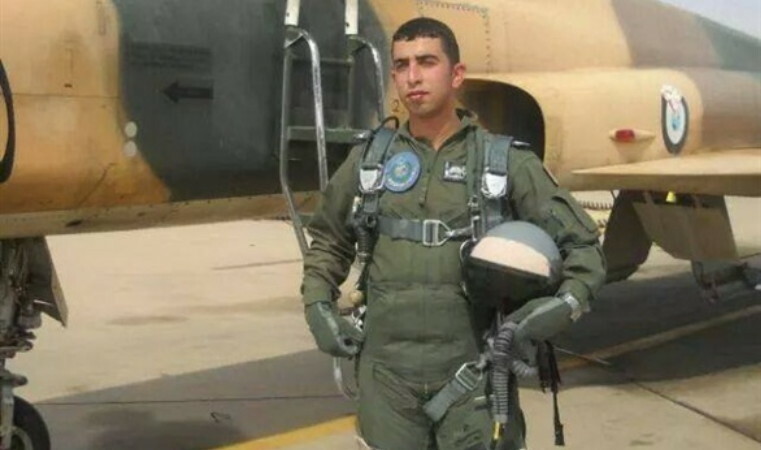 Click here for the archive of posts on Lieutenant Moath Youssef al-Kasasbeh.